This article is 3097 days old. In only three days from now, the polls will be closed, and Pepsi Cola Canada will be awarding four organizations with multi-thousand-dollar grants toward making huge improvements in their communities. And Windsor is leading with not one, but TWO of those organizations. The Windsor Essex Humane Society has been in first place for a $100,000 grant from Pepsi since the summer, and St. Anne French Immersion School in Walkerville is at the top of the leaderboard for a $10,000 chunk of funding toward greening its schoolyard. But how can you help? All these organizations need from you are a few solid clicks of your mouse! 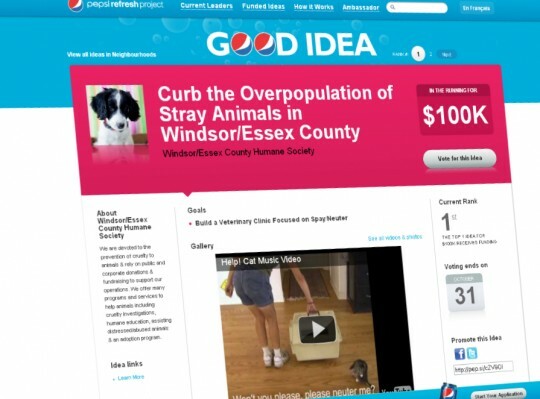 The Humane Society’s funding idea is currently battling for top position with the Second Chance Pet Network of Dresden Ontario for the $100k spot. Some days Windsor’s pitch drops to second, and in these final days of voting (the Refresh Project voting ends on Hallowe’en — Sunday), both ideas need your help to achieve victory. St. Anne School hopes to “build a natural path that students can use in all seasons, protected by large trees” and “improve our small piece of land by planting native plants to reduce erosion and dust when the students play” with $10,000. The Humane Society is wishing for $100,000 to complete the next phase of their newly revamped location in South Windsor with the addition of a Veterinary Clinic. The new Vet Clinic “will be focused on the spay/neuter of cats and dogs” and the Humane Society says “this project is critical to our goal of ending the needless euthanasia of companion animals in Windsor and Essex County by 2012”. To donate a few mouse clicks (you can vote daily), check out the Pepsi Refresh Project website, create a username and VOTE until the end of the day Sunday. With just a few clicks of your mouse, and a dozen keystrokes, you can have a tremendous impact on the future of Windsor!